Both offices will then close from Christmas day and reopen resuming usual service from Wednesday 2nd January 2019. May we take this opportunity to wish everyone a very good festive break from all of us at CASW. More than half the people who came to Citizens Advice for help in South Warwickshire are having problems with claiming benefits, according to their Annual report 2017-18 . Universal Credit has been introduced to the Stratford District area, but Warwick district has only just had the welform reform measure introduced and more problems are expected. Universal credit and other benefit issues such as tax credits were responsible for 10,000 problems faced by the local charity in 2017 /18. In total Citizens Advice South Warwickshire handled more than 32,000 issues, with one in four of the clients having debt problems. There was a rise in the number of people coming to Citizens Advice for food bank vouchers because their income was insufficient to support themselves or their families. 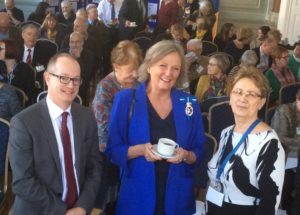 Yvonne Hunter, chair of Citizens Advice South Warwickshire told the annual general meeting: “Many of our clients are struggling with increasingly complex issues and often we are the only source of help when they need someone to speak up for them”. High Sheriff Clare Sawdon presented long service awards to volunteers and staff. Warwick District Councillor Neale Murphy, a former fireman, said Citizens Advice had saved more lives than he had during his career. Citizens Advice South Warwickshire has been awarded a total of £182,750. It’s the first time the Trust has given funding for a period of three years to secure the future for the core service. Beth Nicholson, Marketing and Development Manager for Citizens Advice, said: “As a local charity, this grant means our frontline services are secure for the people of Stratford. We can continue to give our clients a lifeline when they are in difficulties and need help. Generous grants of more than £25,000 have secured the future for a vital help at home service for people in need in the Warwick town provided by local charity Citizens Advice South Warwickshire. 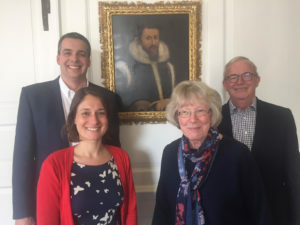 The Charity of Thomas Oken and Nicholas Eyffler and Warwick Town Council have given the money to support the Reach Out and Help service run by Citizens Advice. The service helps people in crisis who aren’t able to access help at the normal advice sessions. Since September 2016 one caseworker has helped 71 people in Warwick town, some of whom are very socially isolated. But the new funding means that the service could help about 132 people with issues such as benefits, debt and money management issues as well as getting access to the health and social care they need. “The problems we find behind these closed doors can be heartbreaking, but working with other organisations we are able put together holistic support to meet people’s needs and help them put life back together”. 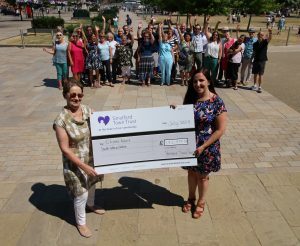 The Reach Out and Help service in Warwick town is supported with a grant of £21,123 from The Charity of Thomas Oken and Nicholas Eyffler, £5,000 from Warwick Town Council and is also helped by a £2,500 grant from Orbit Heart of England housing association. Mick is a 76 year old man living with his wife Eva in sheltered housing in Warwick. Mick is the primary carer for Eva who has Parkinson’s and early dementia. He was referred to us by his GP surgery as they were concerned Mick was not coping with his finances and struggled with his caring duties. He was getting increasingly confused and suffering from mobility issues as well as other physical ailments. Soon after we started to help, Eva was hospitalized and transferred to 24 hr care. Our caseworkers helped Mick to explain the change of circumstances to different organisations, including the District Council that recalculated his benefits and helped him deal with his personal and previous business debts. Mick’s paperwork was particularly chaotic. We managed to untangle it and pass it on to Ella, his daughter after we secured a free legal appointment for her to help arrange Power of Attorney and Appointee so she could control her parents finances. We arranged for Attendance Allowance and helped Mick get a Motability car. He has slowly been getting on top of his finances. We are still in touch with Mick, waiting for his wife to be discharged from hospital and ensure that Mick has sufficient benefits and support to look after Eva properly. A Stratford volunteer with Citizens Advice has helped more than 6,000 clients during her 25 years service. Jenny Wood-Hill started as a volunteer adviser in 1983, in the pre-computer days of carbon paper to type forms in tripli cate and big paper files and reference books. She told colleagues at Citizens Advice South Warwickshire that the service was very different without computers and the internet. The problems of clients today were usually more complicated than before. Jenny said she had found volunteering very rewarding, knowing that she has been able to help so many people in difficult circumstances, and she appreciated the fantastic support and camaraderie of colleagues. 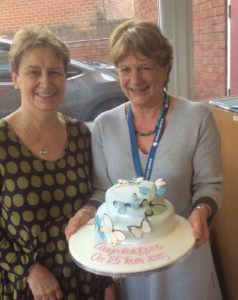 Yvonne Hunter, chair of the trustees of Citizens Advice South Warwickshire, thanked Jenny for her continuing service and said volunteers were vital in today’s difficult times. 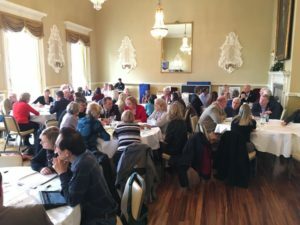 Citizens Advice brought together key organisations in the South Warwickshire area who represent the communities we live in, but serve different needs. We wanted to see how CA and the wider third sector could work on these priorities and help those most in need. Our focus was on two areas – financial inclusion and health and well being problems. A full list of who attended can be found at the end of this summary. The session was opened by Dave Webb, Executive Director of Stratford District Council, Chris Elliott, CEO of Warwick District Council and Phil Evans, Head of Community Services at Warwickshire County Council. The common themes that emerged from all of their priorities were to work well with partner organisations, listen to the needs of the communities, be able to intervene earlier with problem issues and better use of technology. The 10 workshop groups were able to bring their focus on the issues under discussion. Since the worksh ops, we have taken the opportunity to pull out common themes and concerns raised through the workshop groups to bring them together in one document. We would like to continue this dialogue with some of our partners on these areas, which are priorities for us all. As a very busy generalist front line service, CASW is able to help assist with many of the issues delegates identified and discussed. We are also aware that we all work better together as a partnership. Importantly CASW is often in a position to spot emerging issues at an early stage, by working with partners we can set up special projects or areas of help at an early stage. Under the two headings, here’s a summary of the subjects that were raised and discussed. Our Chief Executive, Aidan Knox, is keen to establish a reference group to see if working with our partners we can find better solutions to these issues. Early intervention not crisis management. This applies to both health and wellbeing as well as financial inclusion. For many with mental health problems there is little support with benefits or housing unless they are in a crisis. Helping clients to deal with their issues by working with other agencies. There is pressure on social services to resolve issues quickly, but what about the need for ongoing support ? Starting from Wednesday 14th June, Citizens Advice will run an outreach service at The Packmores Centre, Warwick. Running appointments every Wednesday between 10am – 1pm, drop by to receive advice on managing your money, benefits, debt, housing, employment, family, legal and many other issues. To find out more or to make a confidential appointment please speak to reception at the Packmores Centre or telephone 01926 492488.